Are you ready to work in the Southwest? Santa Fe, New Mexico offers a small town feel with big city benefits. Locally owned restaurants, art galleries, museums, and live music are just a few of the activities that make this area special. 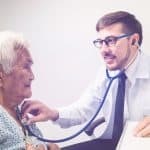 Step out of what you think you know about the desert and join our team of medical professionals! 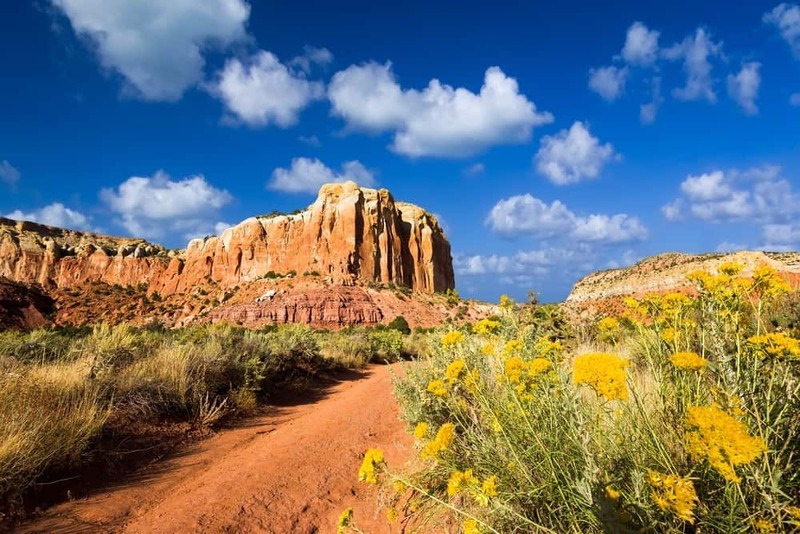 At 7,199 feet above sea level in the high desert with a population of just over 83,000, Santa Fe has the laid back feeling of a town with the amenities of a city. Hotels, motels, inns, and more are ready for you, along with camping, hiking, and a host of indoor activities. With an altitude well above the 5,280 feet of the Mile High City of Denver, visitors are encouraged to drink lots of water to combat altitude sickness. Start with a professionally guided tour on Santa Fe’s oldest tour company, Loretto Line, to learn from the local guides. Since 1992, they have been offering tours of their favorite hot spots, including a few that you may not find in your tour book of the area. Tours leave from the Loretto Chapel (we will tell you more later in this article) and La Fonda, the historic Santa Fe hotel, several times a day. It’s always an educational and entertaining experience! If you’re not into trolley tours or want another way to see the city, we recommend biking tours. Named a Top Ten Mountain Biking Destination, the area offers bike paths and trails for riders of all ages and skill levels. Celebrate the biking and craft beer culture at the annual Bike, Brew, and Beyond or join the Santa Fe Century for a 20, 50, or 100 mile ride through the state. More information on the Santa Fe Tourist website. There’s no better way to experience Santa Fe than to explore the outdoors. Santa Fe Mountain offers skiing, hiking, and camping against one of the most beautiful backgrounds you might ever see. Grab an annual pass, attend local events, stay overnight, and experience the Southwest in the mountains. For a culinary experience, check out the Restaurant Walking Tours and other events at the Santa Fe School of Cooking. With over 30 years in business, the school offers private parties, cooking classes, and an online market, all under the guidance of industry professionals. If you’re looking to be indoors more than outside, there are culinary experiences like cooking classes at Las Cosas that are taught by a professional chef. Not only that, but Las Cosas sells kitchen accessories to make the chef in you drool. It’s a worth a stop even if you’re not taking a class. For those who want to sit quietly, sip a hot beverage, and read a book, we recommend The Tea House. With teas from China, India, Japan, Sri Lanka, and Santa Fe, you’re sure to find something you like or you can create your own. Unsweetened matcha latte is a favorite among locals. Later in the day, wander over to Tumbleroot Brewery and Distillery to taste locally brewed beer and distilled adult beverages, hang out with friends or make new ones, and listen to live music. If you’re looking for a nationally recognized, locally owned restaurant, check out Geronimos. Operated out of an adobe home built in 1756, the restaurant offers options like fiery chile and honey grilled Mexican white prawns, locally raised beef, and wild mushroom and sherry bisque. It’s recommended that you call ahead and make a reservation for your mouth-watering experience. Near Geronimo is The Compound. A higher-end restaurant, they offer lunch and dinner menus that include house made pasta, pan seared duck, and crab and lobster salad. If you’re looking for small bites, we recommend La Boca, the best tapas restaurant in the area. The menu includes New Mexico pistachios, watermelon salad, and paella. You will never go hungry in Santa Fe! There is no shortage of arts and culture in Santa Fe. Learn about one of America’s greatest artists when you visit the Georgia O’Keefe Museum. Look for special events like Wednesdays with O’Keefe when visitors board a bus for a tour of Ghost Ranch, O’Keefe’s home for 50 years. The Museum of International Folk Art is a must-see if you’re interested in learning about art from around the world. Founded in 1953 by Florence Dibell Bartlett, her vision was best summarized in her statement, “The art of the craftsman is a bond between the peoples of the world.” She sought to bring people from around the world together peacefully in one place through art. The Santa Fe Society of Artists hosts events throughout the year where visitors can meet the artists and purchase works directly from them. In a world focused on digital communication, it’s refreshing to see a place with real people connecting in meaningful ways through art. Last and certainly not least, is The Loretto Chapel that we mentioned earlier. Whether you’re religious, curious, or a combination, you’ve got to stop and see what some call the miraculous staircase. 20 feet high with two 360 degree turns and no center support, the staircase defies gravity and engineering by resting entirely on its base. The risers and 33 steps are all the same height and made from an extinct wood species. 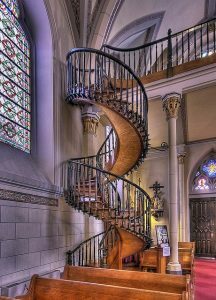 Because of all these reasons, and more that you will learn when you visit, the Loretto Chapel has been known as something of a miracle. Worth it just to hear the story and see the craftsmanship even if you’re not religious. 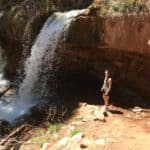 If you’re seeking an adventure in the Southwest, Santa Fe has quite a lot to offer whether you crave the solace of museums, the taste of locally made cuisine, or the fun of an outdoor adventure. Visit our New Mexico Jobs section to learn more.